I came away as a single dad with 3 children aged 22,15 and 13 for a happy family holiday. My children have changed from innocent fun loving kids into drunken delinquents in front of my eyes . My eldest has been harassed by a rather large looking girl who was part of the so called entertainment team by Snapchat and various other social media outlets until he succumbed to her charms. My 13 year old daughter has been secretly drinking and being sick in my shoes . And I have sat at a cabaret show and had to sit embarrassed while the lead entertainment rep sang the wham rap in my face SHOUTING hey sucker at the top of his voice in front of the entire hotel . I also won the (can u stick it challenge) and when the prize was given out on the evening i was not even in the top 3 . The food was ok , the room was good but there was much to dislike about this holiday . To summarise I would recommend this hotel for a fun family holiday if you don't much care for your kids . Hotel tip: Away from the Reps . Extremely friendly happy staff, fantastic food - ate so much as it was all amazing. Excellent cleanliness, the rooms were cleaned everyday apart from Thursday and Sunday, an amazing apartment - 2 large single beds in bedroom. Large modern bathroom, huge living area with lovely sofa bed, table, TV, dining table and kitchen area with fridge and a great balcony, very modern and we had a sea view (in the distance). It is in a great location only 15 minutes to the beach and many bars and eating places. 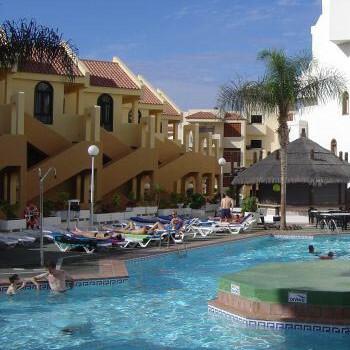 A great place to stay and it is within walking distance along the coast to Los Cristianos. Would highly recommend this as a place to stay. Hotel tip: Main pool area is quite lively consider using the other pool. Checked in and got our wristbands for the All Inclusive and a card for 10% off at the hotel supermarket. The guy on reception told us there was a 24 hour supermarket just down the road. I had requested a room on a high floor facing the pool and we were allocated Room 509A which is the top floor. The lift was just opposite reception and was very handy as we saw later that some of the rooms are a trek through the hotel. The apartment was really nice and in typical Spanish style and our one certainly wasn't worn, it just wasn't as modern as some hotels. The bedroom was a good size with twin beds. There was a 3 door wardrobe with 3 drawers inside, 2 bedside tables with a drawer and a table/dresser with 2 drawers and mirror above. There was another table with 2 drawers in the hall and a large shelved cupboard which housed a dustpan and brush and a mop and bucket. The bathroom had the usual toilet, bidet, sink with large mirror above and a shower over the bath. Water pressure wasn't good and was just a trickle at the sink. I was going to report it until someone else commented that their room was the same. The kitchenette had a sink, 2 ring ceramic hob, kettle, toaster, coffee maker and fridge. There was a cupboard above with plenty crockery and glasses and 2 cupboards and drawers below with cutlery and utensils. A scourer and tea towel were provided. The lounge was big and airy. There was a round, wooden dining table with 3 chairs, a 3 seater sofa and an armchair with a coffee table and occasional table. The CRT TV was on a dresser with 3 drawers and 3 cupboards. There are a few Spanish channels and Eurosport. British TV is payable. The deposit for the remote is refundable on return. I had done my research beforehand so the additional charges were no surprise. The balcony was big with 2 chairs and a table with a good view of the pool and got the sun all day. We also had a sea view being on the top floor. The hotel no longer provides wifi. There is free wifi available from Wifi Mundo, but it is dial up speed. You can pay them for premium internet however if anything it was slower than dial up and pages could take 10 minutes to open if they opened at all. Meals are served in the Mirador restaurant. Breakfast is 7.30-10.00, lunch 13.00-15.00 and dinner 18.30-21.30. The food was good with omelettes made to order and the usual breakfast fare. Coffee was good. At lunch and dinner fresh meat being cooked to order and there was also a carving station. Wine, beer and soft drinks are available in the restaurant. One thing we did note is how quickly the plates were cleared. It didn't even have time to put mine to the side when it was whisked away. Drinks were stronger than we have had at other AI hotels, especially at one of the pool bars. There is also a good selection of frozen cocktails. Snacks are only available in the afternoon at the pool bar and not at other times. The AI drinks are served from 10.00am until 11.00pm. Evening entertainment is held in the Millennium Cocktail lounge where there is also bingo every night. All the staff we encountered were really friendly and helpful. The hotel is located on a small hill which may be a concern for anyone with breathing difficulties but it wasn't too bad. There is no air con in the rooms. You can hire a fan from reception. There are 3 pools, 2 main pools and a kids pool behind the pool bar which is very quiet. There is also a sun terrace one floor above the main pool. One of the patio chairs broke when hubby sat on it. We told the maid and she had someone replace it with a new one less than 10 mins later. We also asked for extra pillows and they were provided too. There is no room cleaning on Thursday or Sunday. However there is always an army of cleaners constantly cleaning the hotel and the tiles at the front of the hotel were washed every morning. We tipped the maid every day rather than at the end of the week, in case it is a different maid, and she was really delighted. The sunbed hoggers were out from 7am every morning to bag their spot even though the pool wasn't that busy while we were there. I can imagine it would be a lot busier in the summer. There is a small supermarket at the hotel which was cheaper than the 24 hour one a few doors down. There is a self service laundrette at the hotel. The Pub is a couple of minutes down the road and the Wigan Pier and Bar Miami a little further. It is about a 10 mins walk to the beach, passing shops and bars on the way. The CC Gran Sur is just over the motorway bridge and a 5 minute walk away where there is a cinema, supermarket and a good selection of shops. We visited other grander 4* hotels, but for the price paid we were more than happy with the Playa Olid. Stayed in this hotel in February this year, the rooms are very spacious and cleaned everyday part from Sunday. The small pool area is very clean and the bar area does not open until 12pm, the large pool is also very clean. We went all inclusive and there was a large variety of different foods, and plenty of it!! The entertainment wasn't very good at night, but then again it was February. The staff are very friendly and nothing is too much trouble for them. I would stay in this hotel again. The hotel was nice, the apartment clean and a good size. We had booked self-catering but were given all inclusive bands on arrival so had free drinks all day at pool, which was quiet and had plenty of sun loungers available. We didn't try the food at the hotel but would recommend Torviscas Indian Tandoori or Intercontinental Restaurant for a meal. A pint of beer was 1 euro in most places. The hotel was a 5-10 minute walk from the beach and strip which was ok, until walking back up it when it was 30 degrees. We walked to Las Americas along the beach which took about an hour and a half but getting a taxi back only took 10 mins as was a straight road along the motorway and this only cost 6 euro. Would visit Costa Adeje again but to a hotel nearer to the beach. We booked this apartment for 2 adults and my son who was under 2 years old. We were informed this was a child friendly apartment complex and comfortable. We arrived at the complex after 11 at night had a quick check in. staff appeared friendly. Was not shown to where the apartment was so we spent an hour with 2 large suitcases 2 had luggage a baby and a buggy walking around a maze with a number of other people trying to locate our room. When we found our room the balcony door was unlocked. When we tried to lock it we had to use a bolt in the floor. On inspecting the balcony my son would be well and truly able to climb up and jump off it was scandalous. The room appeared very basic spacious but grubby and apartment wasn’t cleaned properly after previous guests. The baby poor outside was disgusting I wouldn’t wash a dog in it so we used the big pool a few times during the week on our first morning there we ate the full English breakfast! Don’t eat there we got a frankfurter with luke warm beans stone cold sweet toast just awful!!! the staff had to be contacted to re clean the apartment which they did a couple of flooded toilets around to many steps for buggy’s I wouldn’t recommend it with children especially boring with a karaoke bar and a couple of pus which were crap one nice one is called ‘the pub’ staff are lovely here. We stayed in the Playa Olid from 26/12/08 to 9/1/09 ,we had a great holiday,staff pleasent,room nice and big with large balcony only complaint as someone said before floor was not cleaned properly after previuos guest but everything else OK plenty clean towels & sheets,would definatly stay there again. These apartments are rated 3* I would only give them 2*. On arrival we were given a room on floor 1 in the blue block, very easy access up in a lift 1 floor and there our apartment was. The beds were 3/4 size, plenty of wardrobe space, the bathroom small and the lounge had a wooden sofa which was a bed (ok if you are 5"5 or less, and another bed, table and chairs, and a fridge, toaster kettle and two electric rings. Basic but ok. The door to the balcony was secured by a bolt in the floor and the doors had glass panes easy to break and open the bolt!!! We were on the same level of the paths very easy to climb in to the balcony, but from a safety point of view better due to the children even the 3 year old being able to climb over. The higher balconies were the same. After reading previous reports about the thefts we hired a safe at 37 euros for two weeks with a 5 euro deposit back on leaving, PLEASE HIRE A SAFE IF IT MEANS HAVING A DRINK OR TWO LESS. Whilst there we heard of 15 thefts in different rooms, some had safes and had left the safe keys in the apartment and others had no safes, money, cameras, mp3 players etc. stolen in all cases. We did not have anything taken from our room but we locked it all in the safe that was very large and took the key out with us, it fit the video cam, PSP, hair straighteners, camera, watches, phones etc. all inside. signs during the second week were put on all safes telling you to take your key with you, please do or it will end in a taxi ride to the police station at a cost of 25 euros return trip, to give statements to the police, I’m sure no one goes on holiday for that!!! The rooms weren’t the cleanest I've stayed in, we always tidy up before we leave so it's not hard for the cleaners to do their job!! The sinks etc. not cleaned, the floors mopped to a fashion, when I complained to reception the room was re done and wow it sparkled!!! The towels had holes in the well at least 2 per day, even the sheets had cig burns/small holes again if you complain they change them without quibble, found the staff to be very nice and polite no complaints there. The pools of which there are two large and a very small 10ft round baby pool had plenty of sunbeds if you got one that didn't have a towel sat on it for 8 hours without anyone using it. By the end of the first week if we couldn't get one and no one used it for an hour we removed the towels and used the beds, no-one ever said anything. The pool was always warm by dinner due to the heat between 85-105 degrees for the two weeks there. The only complaint is there are no parasols around the pool and it gets very hot, spent most of time on a lilo in the pool to keep cool. The apartments had a pool bar that was very good for prices on drinks and ice-creams and a shop also only about 50 cents more per item than the supermarket at the bottom of the hill. The toilets in reception at the pool always clean, saw only one cockroach in the two weeks we were there. All reception pool areas and walk ways kept clean around the apartments. For what we paid £1400 for two weeks we didn't moan, as we only spent time there sleeping, washing and getting dressed to go out. Got quite warm some evenings, and due to being on the 1st floor left windows and door shut, could hire a fan just down the road to the left at an English pub called the PUB.